OTTAWA — As Canada’s military mission races to leave Mali and the United Nations pleads for it to stay, the European Union is making a fresh appeal to the Canadian Forces to partner with it in the West African country. Gen. Esa Pulkkinen, director general of the EU’s military staff, told The Canadian Press that he has asked the Canadian government to bring its military training expertise to Mali as part of a broader effort to stamp out Islamic extremism in Africa’s Sahel region. Pulkkinen said he’s aware of the context of his request — it comes as Canada faces pressure from the UN to extend its Mali peacekeeping mission in order to bridge a gap until Romanian replacements can arrive. But he says Canada would make a great bilateral partner with the EU’s military training efforts in West Africa, which he says are crucial to stamping out security threats to Europe. Those threats include the mass northward migration to Europe, an increase in the smuggling of arms, drugs and human trafficking, as well as terrorism. Pulkkinen was in Ottawa this past week, and said he was planning to make a formal request to Canadian officials after raising the matter informally. “I need brains. I don’t need the quantities,” he said. Pulkkinen already commands 1,000 troops in Somalia, the Central African Republic and Mali, and is partnering with the United States on various missions on the continent. He said the EU wants to ramp up its presence in Mauritania, Burkina Faso, Niger and Chad as well. Joining forces with Canada would be a natural fit, he noted, because the EU mission is predicated on the same shared values. “We try to find other partners that share the same universal Western values as we have. They are very important when you provide education for our African troops,” Pulkkinen said. But the mission will be a tough sell for the EU. Canada is in the final throes of withdrawing its eight helicopters and 250 military personnel from Mali, where they have been providing emergency medical evacuations and transporting troops and equipment across the vast country. The drawdown has moved the UN to formally ask Canada to extend its mission in what appears to be a final effort to prevent a gap in military medical evacuations for wounded peacekeepers and UN staff. The UN sent a formal request, in writing, to the federal government late last month after months of behind-the-scenes prodding got them nowhere with Ottawa. The letter marks an unusual step: the UN usually only makes such requests if it believes it stands a good chance of a positive response, which in this case is far from certain. The government, including Prime Minister Justin Trudeau, has repeatedly played down the gap it would be creating by leaving Mali on schedule. Pulkkinen’s request on behalf of the EU will only increase the pressure on the Trudeau government, which has faced criticism for what has been seen as a relatively weak return to the business of UN peacekeeping due to the Mali mission’s modest scope. The Liberals made peacekeeping a signature foreign policy promise during the 2015 federal election. Canada will face pressure this coming week when the UN hosts a major peacekeeping summit in New York, the first one since Vancouver hosted a similar gathering in November 2017. Foreign Affairs Minister Chrystia Freeland is expected to attend next week’s peacekeeping summit in New York, but her office did not immediately respond to requests for comment. TORONTO — An Ontario court has upheld an order that suspended legal proceedings against three major tobacco companies, rejecting arguments from lawyers representing Quebec smokers. Ontario Superior Court Justice Thomas McEwen issued his decision Wednesday but did not lay out his reasons, saying those would be released at a later date. The companies — JTI-Macdonald Corp., Rothmans, Benson & Hedges and Imperial Tobacco Canada Ltd. — were granted the stay last month as part of the creditor protection process. They obtained the protection shortly after Quebec’s highest court upheld a landmark decision that ordered them to pay more than $15 billion to smokers in two class-action lawsuits. The companies have said they had no choice but to seek the stay so they could continue to operate as they try to negotiate a global settlement with all those who have claims against them, including the class-action members and several provincial governments. But lawyers representing the class members argued the stay in their case should be revoked if the tobacco companies plan to appeal the Quebec ruling to the Supreme Court of Canada. At a hearing earlier this month, they said the companies cannot negotiate a settlement in good faith while also challenging the findings of the court. The lawyers said if the companies plan to seek leave to appeal, the matter should be sent back to the Quebec court so it halt the implementation of its ruling until the appeal process is complete. In his decision, McEwen said the stay order would require parties to seek the court’s permission before launching new proceedings involving the companies, including any applications for leave to appeal to the Supreme Court. The judge had previously extended the order to June 28, with a hearing to be held a few days earlier. The Quebec Council on Tobacco and Health, which was behind the class-action suits, said it would hold off commenting on the ruling until the judge’s reasons were released. Lawyers representing several provincial governments had opposed the Quebec lawyers’ application, saying one group of claimants should not be prioritized over others. 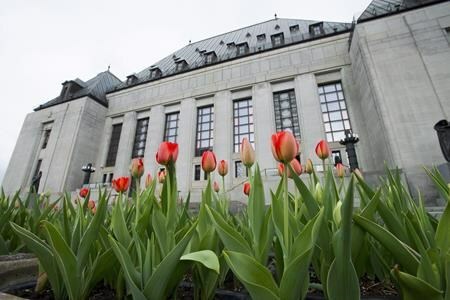 OTTAWA — The Supreme Court of Canada says undercover police officers do not need to obtain a judicial warrant before using email or instant-message services to communicate with someone suspected of child luring. The constable created an email account and Facebook page for the girl in 2012 to see if people online were preying on underage children. The officer received a Facebook message from Mills, who was 32, leading to an exchange of emails that turned sexual. Police used a screen-shot program to capture and record copies of the communications, but they did not have a court-approved warrant. Mills was arrested in a St. John’s park where he had arranged to meet the girl.